For competitive swimmers, winning a race is inseparable from how they start it. The technique and speed of their dive off of the starting block and into the pool can affect their final race time by up to 26 percent. The very beginning impacts it all. Just as swimmers hone the particulars of their start until they’re poised to win, we can mold and shape our morning routine to set us up for a stellar performance in the race of our day. Here are my top five tips for daily success. Want to wake up feeling accomplished? Get your phone to moonlight for you. Schedule automated tasks to happen at night so you can rise knowing you’ve already cut into your to-do list. Have your groceries delivered via Instacart, or use Filld to get your car’s gas tank filled. How many times have you clicked “Remind Me Tomorrow” for that big software update? Why not schedule it for one a.m. when the only task at hand is counting sheep? 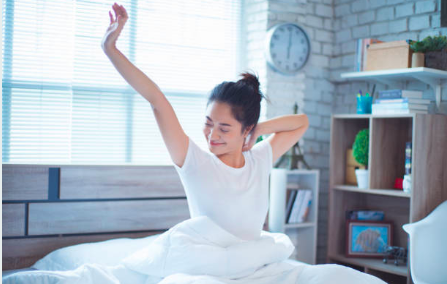 Schedule these must-dos to cross the finish line while you’re sleeping, and voila, you’ve got fewer things to take care of during your precious waking hours. Stop Snoozing. Get Your Pet on a Schedule. Though you’ve heard it a thousand times, this sage advice is no joke — breakfast really is the most important meal of the day. Start with a big glass of water to prime your metabolism and make up for the dehydration that occurs while you’re sleeping. Your brain is about 70 percent water. Staying hydrated boosts your ability to stay focused and alert. Next choose a simple, balanced meal to kick your body and brain into gear. Avoid sugary meals to dodge the post-sugar rush slump. Low-glycemic foods like oatmeal, nuts, fresh fruit, and eggs are great options. They take a longer time to digest (which means your blood sugar levels won’t rapidly spike and plummet), leaving you with sustained energy throughout the day. Too many options can overwhelm our brains. Research shows that the brain loses efficiency somewhere beyond 15 potential choices. The hangup is Choice Overload. To save your brainpower for bigger decisions, create a template that can act as your go-to work outfit. Then, organize those items to hang right beside each other in your closet. Black pants and a button up shirt. Done. A dress with a grey cardigan and tights. Easy. Figure out what attire makes sense for your typical day. If you narrow down the number of possibilities to items that fit within your work template, you’ll spend less time in your closet and more time taking on your day. Most of us know what it feels like to reach the end of a hectic day only to find key items on a to-do list lingering almost mockingly as they stretch into tomorrow unchecked. This often happens because we aim to accomplish more than one day actually allows for. Do your best to set reasonable goals as you’re forming your list. Chart out every hour if it’s helpful. If you need to scribble down each task that’s on your mind to gain a little peace, make a master list for the week, and break the tasks down by day. If the days are too packed, weed out or reschedule what’s inessential. You’ll be more focused knowing that there is, in fact, enough time for each thing you need to do. Let’s be honest — fully conquering a to-do list just feels good. Take time to refine your morning habits, and you’ll set yourself up for victory right at the start.